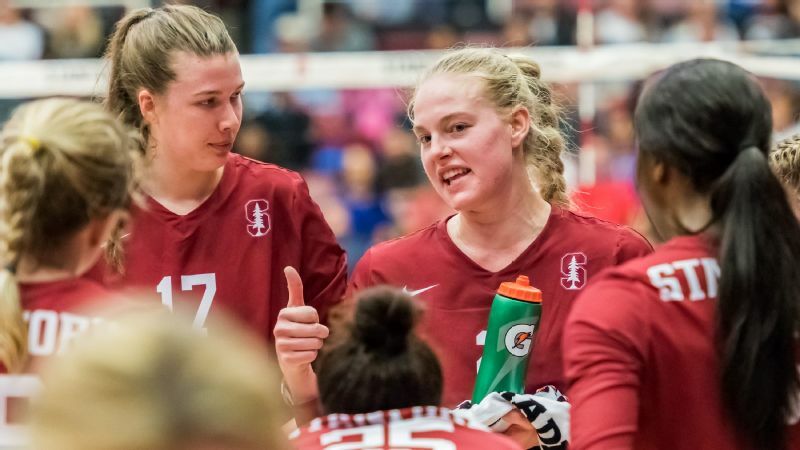 Reigning player of the year Kathryn Plummer, center, says team chemistry was a focus for Stanford during a summer trip through Europe. The Stanford volleyball team was perched above a Croatian canyon one day earlier this summer. A zip line awaited. Some players were eager to launch. Others had trepidation. "But all of them did it, and our whole staff did, too," Cardinal coach Kevin Hambly said. "That's one of our focuses this season: Are we in this together? Because it's one of the things we struggled with last year: We weren't in it completely together." That's not because of any tension among the players. It wasn't even an issue that was noticeable during the regular season, as Stanford lost just three matches and won the Pac-12 title. But what Hambly calls "fracturing" manifested itself in the national semifinals when the Cardinal got on their heels against Florida and lost in five sets. 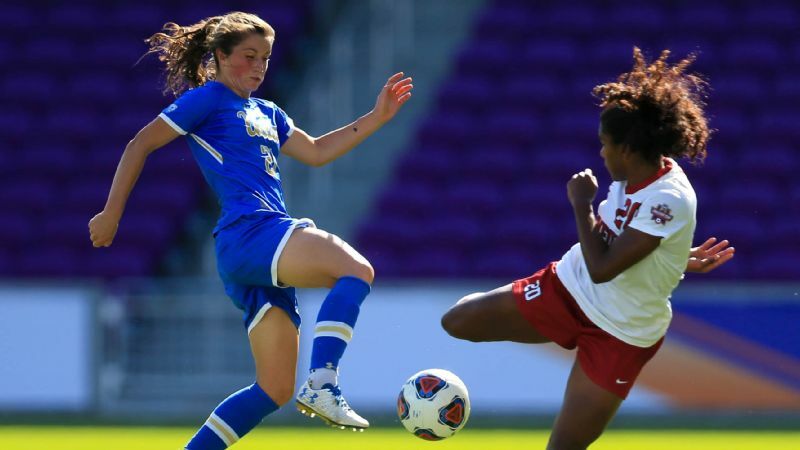 Stanford had seemed poised to defend its 2016 NCAA title. Yes, the senior-led Gators played very well. But what went wrong for the Cardinal? "The pressure of the moment and trying to win another national championship came to light then. I wish it would have come out sooner, because we could have had ways to combat it." Thus, the goal during Stanford's travels through Europe this summer while playing games in Slovenia, Croatia and Italy was to bond more tightly, in good times and bad. "I wanted the toughest competition we could possibly get," Hambly said of the overseas matches. "I wanted us to be tested, and even fracture, so we could address those things and remember those moments. "Can we pull for each other? Can we do it with each other and for each other? That's going to be more of our challenge rather than filling in positions." That's an honest assessment of a team that, on paper, is loaded with talent and experience and thus is the easy pick as preseason No. 1. 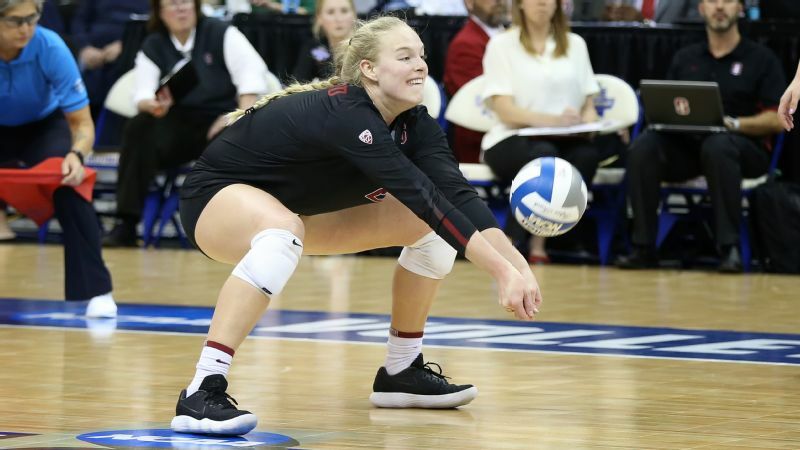 Among Stanford's returnees is 2017 AVCA national player of the year and espnW player of the year Kathryn Plummer. The 6-foot-6 outside hitter is a junior now, part of a stellar class with setter Jenna Gray, libero Morgan Hentz and Audriana Fitzmorris, who has been at middle blocker her first two seasons but will transition to outside hitter this year. Hambly thinks that's ultimately where Fitzmorris can be most comfortable and effective. Like Plummer, Fitzmorris is 6-6; the size that has been so key to Stanford's attack in recent years continues. 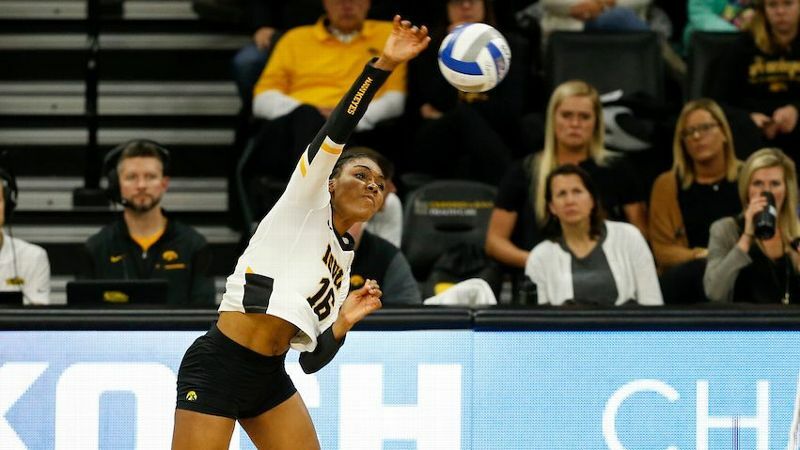 These juniors led the way to the 2016 title as freshmen, although they also had a fifth-year senior then in middle blocker Inky Ajanaku who was that tournament's most outstanding player. Stanford coach John Dunning retired after the 2016 season, and Hambly -- who had led Illinois to the 2011 NCAA final -- took over. Plummer said it was a smooth transition. In fact, most things went smoothly for the Cardinal in 2017, until they didn't. 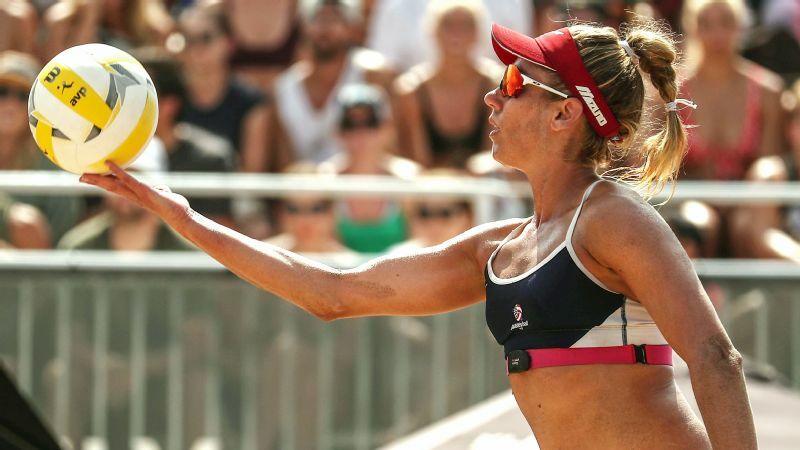 "It wasn't good for us to lose that match, but it's definitely a lot of motivation going forward," Plummer said. "Our mindset is about being a collective group instead of just being individuals. We have worked to get that bond, and get our chemistry to where it should be." Plummer said the European trip helped. 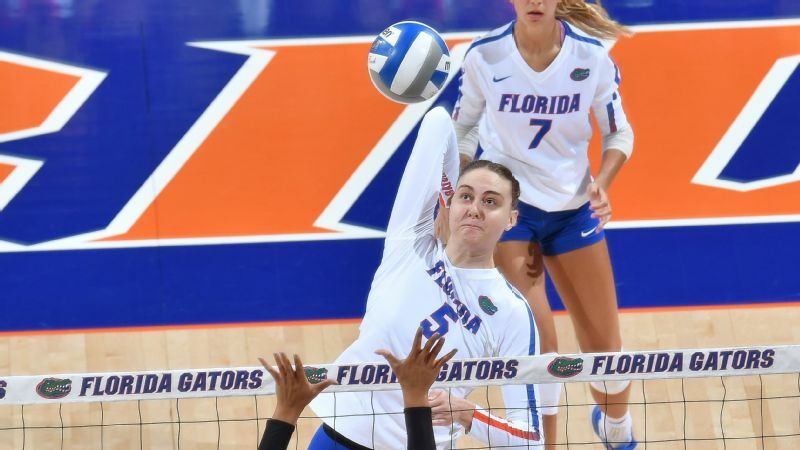 It also allowed the freshmen, middle blocker Holly Campbell and outside hitter Mackenzie Fidelak, to get quick exposure to some of the intensity they'll face this season. As for Plummer, when you're the player of the year as a sophomore, where do you go from there? She still sees a ton of room for improvement, and not just on the court. "I want to be more of a consistent and reliable passer," she said. "I want to be a better leader, that go-to person as an athlete and a person. So if people have something going on in their life they want to talk about, I want to be that sounding board. I've always had people here who've been that for me, and I want to be that for someone else." Plummer is arguably the best offensive player in the nation. She's focusing on ball control during her junior season. 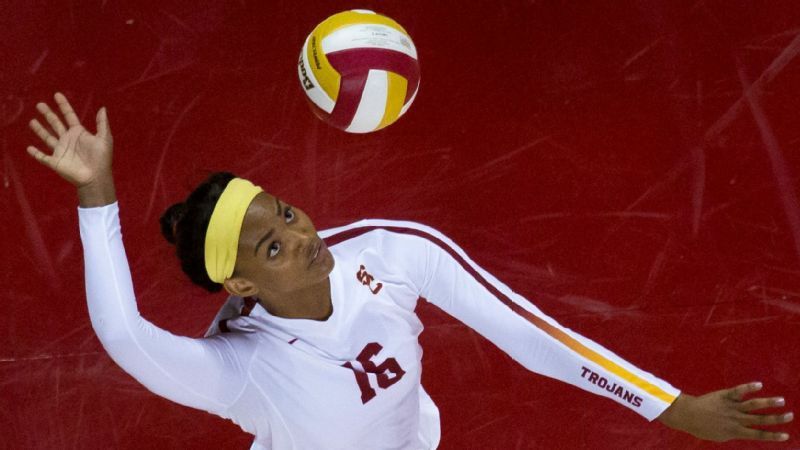 Hambly thinks Plummer's all-around game can become as elite as her hitting, blocking and serving. Last year, she led the Cardinal by averaging 5.39 points per set, totaling 555 kills, 86 blocks (four solo) and 41 service aces. 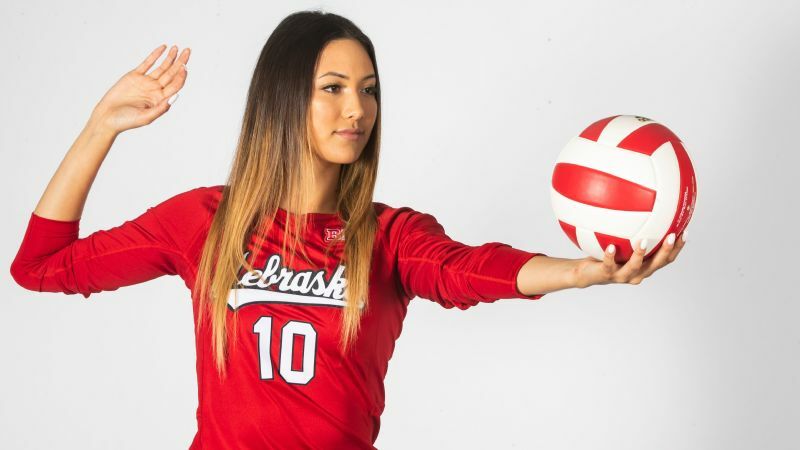 "Her ball control and defense are two things to work on," Hambly said. "She deserved [player of the year] award last year. But she isn't the best in the country at ball control, and she wants to be. She wants to do it at an international level. She can continue to make better decisions attacking and be more aware of defenses against her, but the main focus is the first contact." And the main focus for Stanford is, as always, winning a national championship. The 2016 title was the program's seventh but first since 2004. That 12-year "drought" was quite unusual for the Cardinal, although it reflected some of the sport's growth away from the West Coast. Now Stanford is eager for championship No. 8. Hambly hopes the nonconference schedule -- which includes No. 8 BYU, No. 6 Penn State, No. 4 Minnesota and No. 3 Texas (twice, home and away) -- combined with the always difficult Pac-12 slate will provide the Cardinal plenty of difficulty. Stanford could be so good that there won't be any cracking. That would be just fine for Hambly, too. But he wants to be ready for the worst if it occurs. "What we needed when we were struggling against Florida was to have the skills and capabilities to come together when it felt like we were fracturing as a team," he said. "We think we have a schedule where, if fractures are going to happen, it will be throughout the season a little bit more. And we'll learn from that, I hope, and be prepared to overcome those things if they happen at the biggest moments."